There are many websites referring to The Rezillos; here are some links to the most useful ones. All I need to do is to offer some previously undocumented early history and visual material for the obsessive fans apparently still out there. In March 1976 a guy called Alan Forbes turned up at my door in Bruntsfield, Edinburgh. He had heard I was a bassist, and did I want to join a fun rock 'n roll band he was founding? I disappeared for a moment, and re-emerged wearing a teddy-boy fancy dress outfit, plus my guitar - You mean like this? I said. I was in - Alan clearly perceived that I would fit in with the band's unpretentious self-parodying ethos, while of course I was capable of laying down a mean rhythm line since I had been playing bass intermittently since 1961. Although I could sing once (in a school band 1961-65, where I fancied myself as another Paul McCartney) and, indeed, in the Glasgow University Choral Society (so I could read a score as well), I somehow couldn't get it together anymore to sing and play bass simultaneously. So in The Rezillos I was kept away from all mikes. Like me, Alan Forbes couldn't really sing and play an instrument simultaneously, although he was a very good drummer. We drafted in Ali (Alistair) Paterson as drummer instead, and Alan moved to the front to concentrate on singing and general image. Ali and Alan, together with other Edinburgh Art School students, played together in a rather serious heavy rock band featuring two drummers. Now Alan was never really a great singer, although I admired him for his creative ideas and business acumen. He turned up at rehearsal one day with two female backing vocalists Sheila and Gayle. They were fashion design students, so making and wearing authentic Mary Quant mid 1960s stage costumes was really just part of their studies. After we added a sax player, another Ali, we had the eight-piece Rezillos by August 1976. Saxophonist Ali Donaldson was a good all-round musician, and had played with Silly Wizzard, a well-known Edinburgh folk-rock band featuring the Cunningham brothers Phil and Johnny. To our astonishment, the Friday night student audience of around 500 students loved us, and we had to do several encores before being allowed off stage. Note that we had played no original material at this stage. Starred numbers were played by the guitar/bass/drums line-up only, with Luke singing, to give the front-line singers a break. All this was for a band which was just supposed to be for fun - and it was. That was the secret of its initial success. The serious two-drummer band did one gig at the Art School, then folded, so all the energy went into The Rezillos. In hindsight, the early success over the next seven or eight months was due to hard work, brilliant art-school publicity, no drugs or groupies, and good organisation. We had enthusiastic volunteers like Alpin Ross-Smith who ran the sound system, and roadies who worked just for the free beer. As the only wage-earner I suppose I subsidised the band indirectly, with the use of both my Volvo saloon and my long-wheelbase Transit van for travel all around Scotland. Jo Callis began to write some really excellent original songs. Sheila and Alan became a couple (no surprise there), but Gayle was gradually edged out as being superfluous. Even at this stage the band had two distinct factions - Sheila/Alan versus Jo. We ploughed all the fees back into buying more gear. 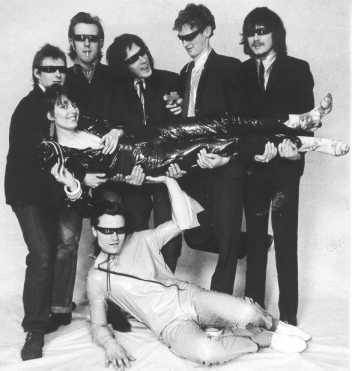 The Rezillos, mid-1977: back (l-r) Luke, Hi-Fi, William, Angel, Dr DK; middle Fay, front Eugene. By the week of the Craigmillar Free Festival the following July we were gigging practically every night - during that week we played 8 gigs in 7 days. The band decided to go pro, and those interested obtained a year's sabbatical from their Art School studies. I already had a promising career as a research geophysicist and had turned thirty, so I decided to quit. Ali Donaldson took over from me playing bass, Mark Harris also left, and the remaining five-piece band went professional. In the long run the factional conflict killed the band, but they had about 18 months of fame. This is about average for UK pop groups. Sheila and Alan went on to form the successor Revillos, and Jo Callis later joined the Human League. Ali Donaldson suffered from mental health problems, from which I am glad to say he eventually recovered. 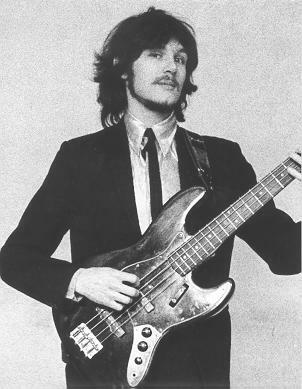 I don't play much any more, although I still own the early 1964 vintage pre-CBS Fender Jazz Bass seen in this photo. My hair is shorter and greyer (but still all there! ), but the beard and gold-lamé shirt have gone. The Rezillos are alluded to twice in The Bridge by the well-known Scots author Iain Banks. The first reference mentions the 1978 debut album Can't Stand The Rezillos, on which I am credited on a track or two (I think), whereas the second explains the origin of Fay Fife's name. Links featuring The Rezillos include Rockin' Rina's site dedicated to the women of the 1970's punk rock scene (failing which try my archived copy of this); the Rough Guide to Rock; Hiljaiset Levyt's punk site; and a Human League site, which I've also archived here. I intend to add some colour images of early Rezillos gigs, but first I have to scan the hundreds of 35 mm slides taken by my then girlfriend Linda Pollock, the Rezillos' first fan.